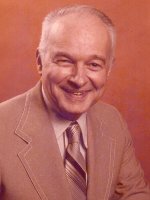 ALBANY – Theodore Barry Skerritt, 90, of Albany, passed away on Saturday, December 21, 2013 at the Riverside Center for Nursing and Rehab in Castleton. Ted was born in Syracuse, and attended Syracuse University School of Speech and Dramatic Arts including Summer Theatre at Oneida Castle and Bridgeport, NY. He served in the Army Air Force during World War II as a B-24 Liberator bombardier with the 8th Air Force. He also served in the Korean war as B-29 Radar Observer, stationed in Japan in 1953. He was honorably discharged as Captain, USAFR, in 1956. Ted was employed as “Ted Barry,” staff announcer for radio station WHEC in Rochester and several stations in Texas including KENS San Antonio, and most recently with Albany College of Pharmacy Library. He also was a news reporter for WROW from 1964-1968 and reported from the city room of the Albany Times Union. From 1968 until 1981 he was an announcer and producer of2-way radio medical programs for Albany Medical College radio station WAMC. He also was a communicant of the Parish of Mater Christi and the former St. Teresa of Avila Church in Albany, where he was a Lector and Eucharistic minister; and participated in Eucharistic Adoration at St. Peter’s Hospital Chapel. A lifetime railroad enthusiast, he also was a member of the NY Central System Historical Society. Ted is survived by his beloved wife Marie Temme Skerritt; his sister Dorothy Brewer; his nephew the Rev. Theodore S. Brewer and his wife Ruth of Simi Valley, CA; his niece Nancy Conte and her husband Edwin of Oregon; and by several grand nieces and nephews. He was predeceased by his parents Municipal Court Judge Harry H. Skerritt of Syracuse and Rena Barry Skerritt; and his brother of Harry Skerritt, age 13. The family would like to thank the staff at Riverside Center for Nursing & Rehab for their compassionate and loving care of Ted. A Mass of Christian Burial will be celebrated Thursday morning at 10:30am by Fr. Kenneth Doyle in the Parish of Mater Christi, Hurst Ave., Albany. Relatives and friends are invited. There will be no calling hours. Arrangements have been entrusted to the Hans Funeral Home, Albany. Interment will be in St. Agnes Cemetery, Menands. In lieu of flowers, memorial contributions may be made to a charity of your choice. To leave a message of condolence for the family or send a sympathy card please visit www.HansFuneralHome.com. Click here to view Ted’s resting place in St. Agnes Cemetery, Menands, NY. The world has lost a lovely, charming, delightful person.. Condolences to his wife, Marie, who will always be one of my favorite people.